Earlier in the week I shared with you my tutorial for the Crunch Stitch, and today I have a fun and re-usable pattern to go with it! I love to use my sweeper mop because of how easy it is. When I ran out of the disposable cloths that came with it I didn't want to buy more. I wanted to make something I could re-use. I googled for patterns and didn't find what I had pictured in my head to use. There are so many great patterns out there, but my favorite stitch for washing and scrubbing is the crunch stitch. So I decided to make my own. The texture in the crunch stitch is why I love it for cleaning and the look of the uniformed stitches is an extra bonus. There are few stitches involved making it a great project to whip up quickly while watching your favorite show. Because they make up fast and affordably they make great gifts and inventory for a craft fair! Below I have used I Love This Cotton Yarn by Hobby Lobby. They have a great color selection, the yarn doesn't fade as much or as quickly as others I've tried, and it's nice and soft to work with. I used one skein to make one mop cover and still had 1/4 of the skein left over! 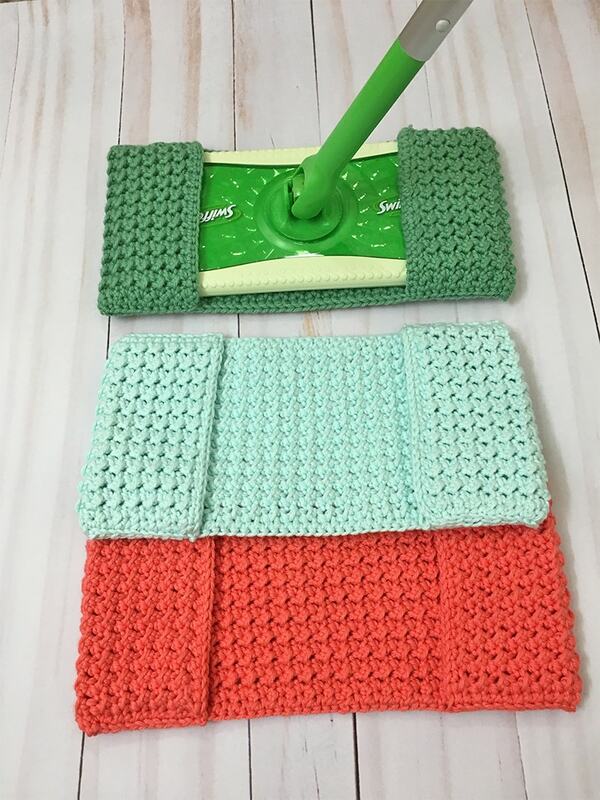 These mop covers measure 10 inches long and 5 inches wide. My posts are usually amigurumi related as it's a huge passion of mine! So, in case you're thinking my niche has changed, worry no more. I will be back on track with a new pattern for you next week that adds to my forest animal friends! PIN this to save for later or purchase an ad-free printable PDF in my Etsy or Ravelry store at a low cost! 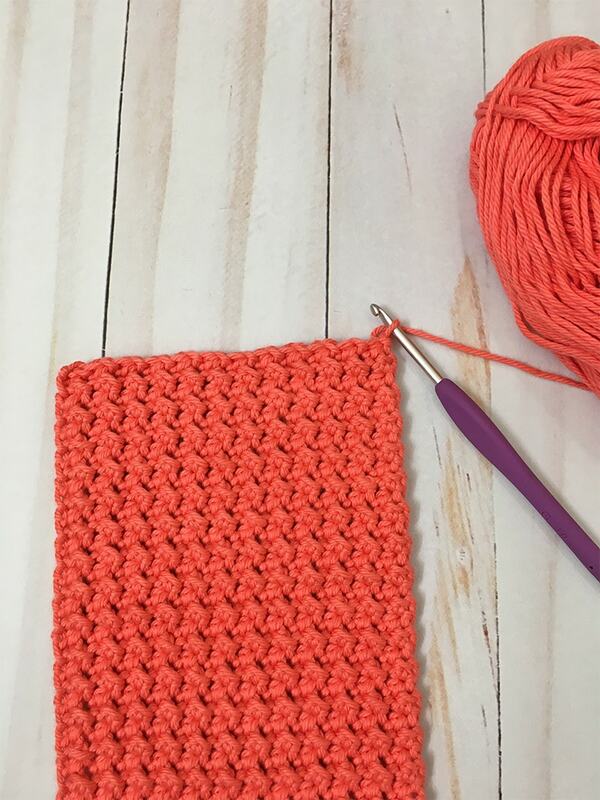 NOTE- Each row will always start with a HDC and end with a slip stitch, this is one of my favorite parts because it helps me keep my rows even so I don't miss or add a stitch. 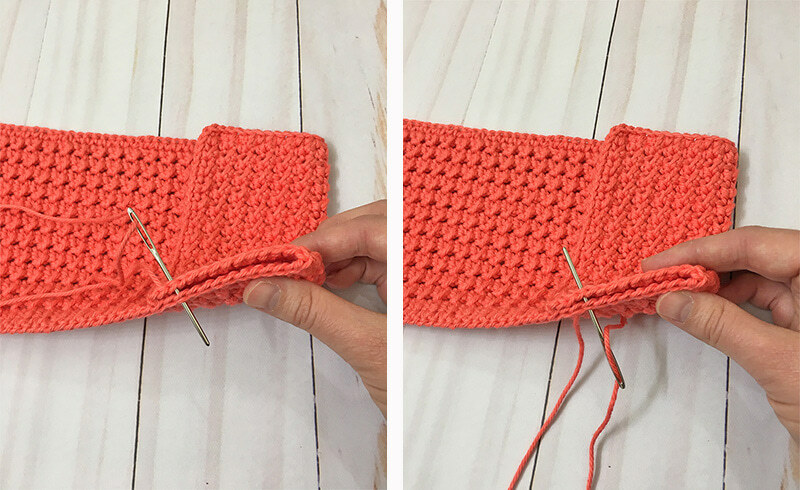 It can also be handy to put a stitch marker in the last stitch of each row, this way when you reach the end you see where you need to place your last stitch. Border: SC around each of the four sides of your work completing 2 SC in each corner. This gives the cover a nice finished work and makes sewing a breeze! Fold each side in 3 inches and sew sides together. I sewed down through the stitches and back up the next to give it a nice layered look. Weave in your ends. You are done and ready to mop! Be sure to join the Grace and Yarn Crochet Group on Facebook and share your projects. This is a growing community full of encouragement and inspiration. Plus stay up to date on new patterns and giveaways! I'm curious, will you make these for yourself or someone else in mind? my daughter in law seen these and asked me if I could make them. I am going to make her several for Christmas. Thanks for sharing!! How do you get it on if you sew up both sides? Each side is only sewn 3 inches in allowing enough room to slide on and to help it stay on. Can it be used to wash floors?Not just dust mop? I'm making this one for myself.The next few will be for my family and friends. I have looked at many covers for the swiffer mop cover and so far, this one SEEMS to be the easiest. She uses LESS stitches and easy stitches. 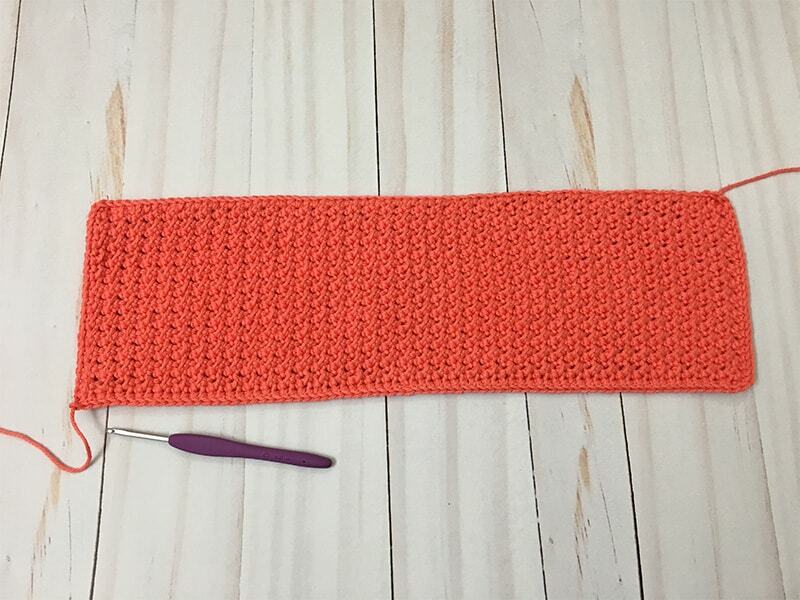 Anyone can make a slip stitch and a 1/2 double crochet stitch is what it says. It is 1/2 of a double crochet stitch. THANK YOU for finally making a swiffer mop cover that I can understand. I have been away from crocheting for a very long time, but my new ceramic tile floors are driving me crazy trying to keep them clean and also not going broke TRYING to keep them clean! When you have 2 dogs, it is twice the love and also twice as many feet to get floors dirty and especially after a LONG winter such as we had here in WI. Buying the yarn today and hope to get a couple covers from each skein. Again, THANK YOU! I love this. Thank you for sharing. I have a question. Since it's made out of cotton yarn, will it shrink once it's washed and dried? Love this, I recently moved into a small one bedroom with hardwood floors and wanted reusable dust/mop pads. Thanks so much for sharing, already started on some for myself and my mother! Thinking of trying with scrubby yarn. Thank you for sharing this. It looks so pretty, could be made from different types of yarn to suit specific purposes, cotton for cleaning, fluffy /angora style wool yarn for dusting etc... can’t wait to try it! These look amazing, Stephanie! I'm going to make myself a few of them. Spring cleaning is upon us! Thank you so much for sharing your talent. Will the still work if I use acrylic yarn instead of cotton? Hi Farah! I haven't tried it with acrylic, it may not wash as nicely as the cotton. So glad you enjoyed the pattern!